Aspen Wall Lamp - Candle Shade. Our aspen wall lamp features a 3-D aspen sprig profile and candle style shade. Aspen Wall Lamp - Candle Shade. Our aspen wall lamp features a 3-D aspen sprig profile and candle style shade. 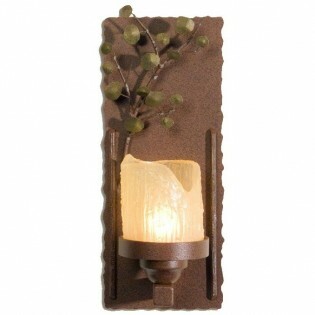 This rustic yet elegant wall lamp is recommended for ambient light as it uses one 60 watt candelabra bulb. This versatile sconce measures 6" wide x 15" tall and is 5" deep. Choose either rust or black finish and right or left position aspen sprig.